I've been having so much fun with these log cabin blocks. They are additive. Once you get the strips cut and organized in order, they go fast. Kim wanted to see what I had done a couple days ago so this is the picture I sent her. So neat to be able to put them in order on the wall. Now I have enough for that whole first row. which includes another house and two more blocks. It's so much fun to see the pattern come together. We have finally gotten our rain and the last couple days have been dreary and good for sitting and sewing. Tomorrow, I'm going down to a Gaithersburg Quilt shop and have a machine quilting lesson. 3 hours. Am hoping to learn how to meander and free motion a little better. I've never had a lesson . Only what I can get over the Internet from Kim answering questions. 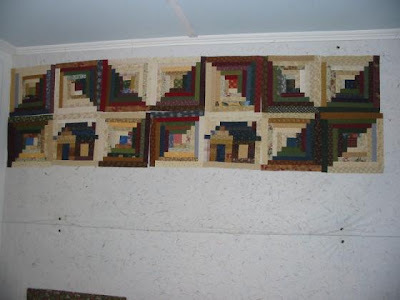 She also sent me Harriet Hargrave's "Heirloom Machine quilting" I'll never get there but it was a big help. I just hope it doesn't rain so much that 270 going down doesn't get loaded up with accidents. I'm leaving in plenty of time. I love how that's coming together. Have a safe and fun trip to the quilt shop! Your log cabin is looking great, Eileen! That's one of the fun parts about quilting--seeing the pattern of a quilt emerge from putting together individual blocks. Have fun today!